Do you find usability concepts outside your work? Oh, we who work with these topics probably run into situations concerning usability and accessibility on a regular basis. Examples are everywhere as shown by the "broken" category over at Mark Hurst's Good Experience. 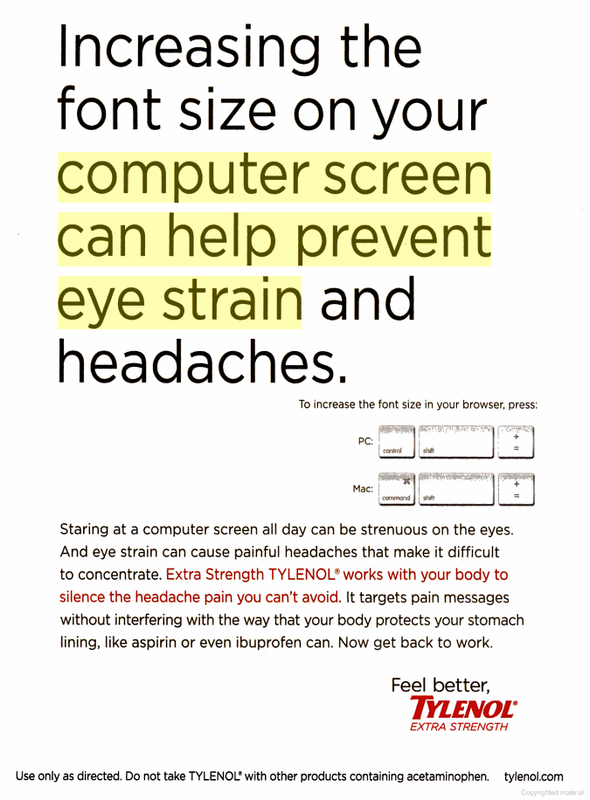 Magazine ad from 2008 provides computer screen help. 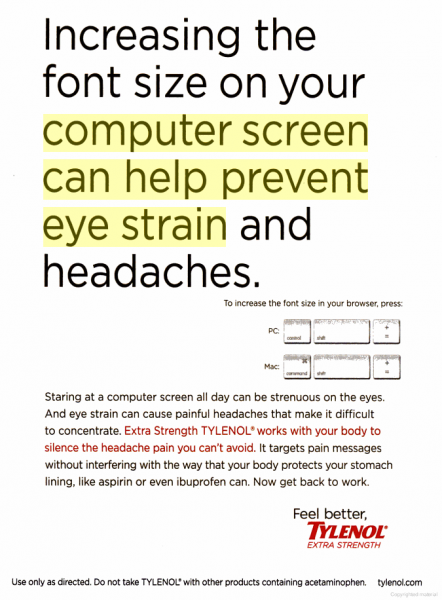 Not only does the ad provide a tip for avoiding eye strain and headaches while working at the computer, it also gives instructions for both PC and Mac browsers. Of course, the ad is a pitch for a product that also provides relief – if you didn't use the tip in time, but it is commendable that a simple usability/accessibility trick is discussed in an ad that reaches the non-professional. And that it takes both PC and Mac into consideration. Unfortunately, there is an error in the Mac tip. You do not need to include the Shift key when increasing or decreasing the font size using the latest Safari or Firefox browser on a Mac. If I recall correctly (don't have a PC handy just now), Firefox on Windows doesn't need the Shift button either. I had to use this tip to enlarge the ad to be sure of what I was viewing. I agree with Randall when she writes that it is ironic that the graphic illustration of the necessary keyboard buttons was very difficult to see. The color contrast and font size on the graphics was poor. Have you discovered mainstream examples that promote usability and accessibility in constructive ways? Do share them in the comments.